This text is the collection of selected commented answers received in Unicode mailing list (unicode@unicode.org) between 29.12.1999 and 17.01.2000 to the question regarding the problem which will be more precisely described latter in this text. Selection of the answers, comments and additional texts were made by the editor of this compilation (Janko Stamenovic), who initiated the discussion about the subject. Janko suggested to the participants of Unicode mailing list the introduction of new character codes for the Cyrillic letters B G D P T, which would allow Serbian readers to easily use Unicode compliant fonts to properly display and print texts in their language. 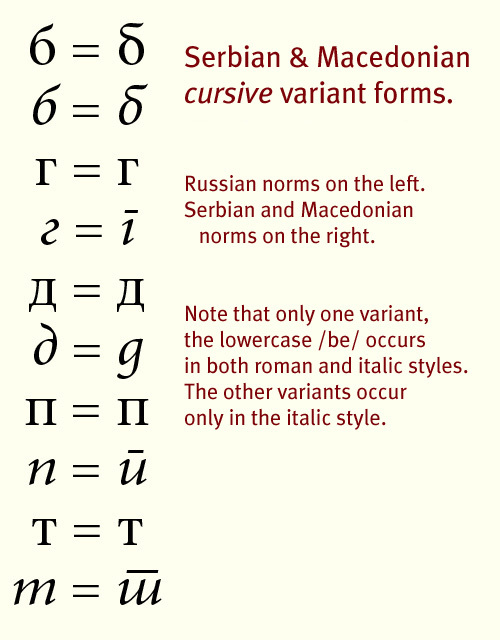 The participants argued that the difference between Russian and Serbian cursive forms of the letters does not make them good candidates for new Unicode characters, and that such differences should be regarded as font-related issues. However nobody knows any operating system, software and/or fonts capable to currently display the appropriate shapes for the specified characters, if the used fonts are not specially designed for Serbian(!) The more universal solutions which are proposed are still hypothetic possibilities, and are based on the assumption that rendering subsystems will differently render the same characters based on the information of the language tags for the text in which such characters appear. Serbian Cyrillic has different preferred shapes for italic Cyrillic letters б г д п т.
Janko's Comment: For Serbian readers the difference in letter B is the least critical. Russian variant will not make the text unreadable, which does not stand for other letters shown. The aim of this discussion/text is to come up to some solution which would standardize the way for proper displaying of Serbian Cyrillic letters, in a way that the reader does not have to have special Serbian version of the software/operating system/browser/fonts to see readable Serbian text. All contributions which would help reaching this goal are more than welcome! Suggested Approach How To Display Culturally Preferred Cursive Forms of Serbian Cyrillic Letters. which shows the common Russian letterforms on the left, and the Serbian and Macedonian preferred forms on the right. Note that one letter, the lowercase be, may have a preferred variant form in both regular (roman) and italic fonts. The font used in the graphic is Adobe Minion Cyrillic, which contains the Serbian glyphs in unencoded positions. Adobe will be releasing its OpenType version of this design, Minion Pro, sometime this (2000) Spring. This font will contain the Serbian forms as glyph variants, accessible through OT layout features (in applications which support the /locl/ or /aalt/ features) and also, in Adobe's InDesign application, through the 'Insert Character' function. These glyph variants have been part of the Adobe Cyrillic font spec for a long time, so I imagine they will also be available in other OT fonts from Adobe supporting Slavic languages in the Cyrillic script. Janko's Comment: Up to now there is no known software which will render the same Unicode characters differently if they are tagged as text in Serbian! John Hudson [tiro@tiro.com]: Make OpenType fonts using the Locale /locl/ layout feature. This feature allows font developers to make glyph substitutions based on language specification, so in a font in which the Russian Cyrillic forms were considered the default forms for the Cyrillic script, a developer could set exceptions for the Serbian language. Alternatively, a Serbian font developer could set the Serbian forms as defaults and specify exceptions for all the other Cyrillic script languages, although this would be less efficient. The /locl/ feature tag has been accepted for registration by Microsoft and Adobe, and will be included in the next update to the OpenType spec. I actually proposed the /locl/ tag with Serbian and Macedonian in mind, but we have since come up with many more useful implementations. Adobe, for instance, will be using the /locl/ tag to enable substitutions of nationally preferred forms of CJKV ideographs. The following topics add to understanding of the main subject, but not directly. They are added only for the completeness. Franko Luin [franko@omnibus.se]: "Italic" is an old English expression and meant at the beginning "Italic handwriting", i.e. handwriting in the manner of Giovanniantonio Tagliente or Ludovico degli Arrighi, both Italian authors of famous handwriting manuals. It was later used for typefaces cut in the same fashion. In printing, normal characters and italic characters were at the beginning two different typefaces. I think it was Claude Garamond who brougt them together. In the trade "italic" and "oblique" have special meanings. "Italic" means a special cutting of the typeface, often with different widths and shapes. "Oblique" means slanted appearance of the normal one. Adobe's fonts, e.g., are called Garamond and Garamond-Italic, but Helvetica and Helvetica-Oblique. Not every language has two different words for that. In Swedish, as in German, both are "kursiv". Robert A. Rosenberg [bob.rosenberg@digitscorp.com]: Traditionally a slanted roman sans serif is called oblique. Marco.Cimarosti@icl.com: Same word is used in Italian: "corsivo" (literally, "running") originally referred to the special shape of letters. This is the usual translation of both English "italic" and "cursive". What I call "sans-serifs" should actually be called "geometric or modern" sans-serifs". John Hudson [tiro@tiro.com]: There is a difference between an italic which is really an obliqued version of the upright (roman), and what is sometimes called a 'true italic'm better known as a cursive italic. The latter, as the name suggests, is modelled on handwritten pen forms, although with conventions of its own. The former, the 'sloped roman' italic is not, as one contributor suggested, 'traditional' in sans serif types in either Latin or Cyrillic typography; rather, it is the common italic in one particular style of sans serif lettering, the so-called geometric or modernist style. The development of humanist sans serifs has led to the application of cursive conventions in sans serif italics. A sloped roman is simply that. The resulting forms may or may not be acceptable to Serbian readers, but if they are changed to model the Serbian _cursive_ forms, however rationalised to fit with their companion letters, you no longer have a pure sloped roman. (Comment by Janko: Sloped roman IS acceptable to Serbian readers, only some of the Russian cursive letters have different forms in Serbian cursive). Janko's Comment: Although tagging of language for parts of HTML document is a good idea, this information is at present not used by any know rendering subsystem. Also, nobody proposed any standard which would extend over HTML boundaries. All comments to this compilation are welcome! The author intends to update the useful information whenever he receives a new facts regarding the subject of this compilation. Compiled and commented by Janko Stamenovic (jankost@iname.com, http://solair.eunet.yu/~janko). Authors of the contributions are credited as their texts appear. Practically all useful ideas for the solution were provided by John Hudson [tiro@tiro.com] from Tiro Typeworks (Vancouver, BC), www.tiro.com, without whom this page would not have almost anything useful. Thanks John!